Fernando's is excited to treat you and your special someone for Valentine's Day this year! Stop in for a sweetheart dinner for two, an 8 oz New York Strip, a twelve oz New York Strip, a Salmon Dinner and Shrimp Cocktail. 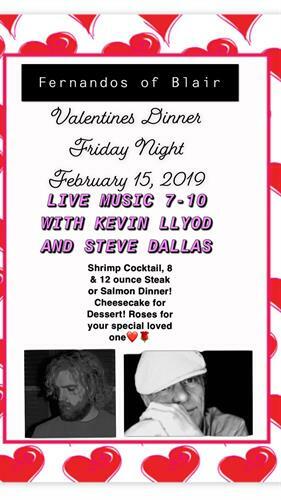 Friday evening we will be featuring Live Music with Kevin Llyod and Steve Dallas! Come check out our drink specials and dinner special both Thursday and Friday nights!